Innovation begins with education. This is something that rang true for the team behind the International Contemporary Furniture Fair (ICFF), which marks it’s 25th anniversary this year. What started as a discussion between Mode Collective, The Architect’s Newspaper and public relations firm Tobin and Tucker on the role of education at the ICFF, evolved into DesignX. DesignX, which consists of 4 days of workshops on the newest digital design tools, will be held on the showroom floor of the ICFF, taking place from May 18th – May 21st at the Jacob Javits center. The hands-on workshops cover techniques such as 3D printing, Cloud Based Designing and 4D printing as well as tutorials on design software such as Grasshopper, Autodesk, and Firefly, among others. Stay tuned for updates on the event! This video is a little old, but we’re huge fans of Bre Pettis from Makerbot. But in a culture and an industry driven by newness, do we risk losing a passion for handcrafted objects and the workforce of craftspeople to make them? “Three-dimensional printing has revolutionised the way unseen elements of 3D objects, such as gears and hinges, are created in jewellery and watches, as well as in medicine, aviation and motoring,” says Wendy Meakin, a senior lecturer in visual cultural studies at Central Saint Martin’s for 15 years and a dealer in the upcoming series of Channel 4 show Four Rooms. “Where is it all going? The unimagined, the unintended, the unleashed,” said Avi Reichental, delivering the keynote address at the Inside 3D Printing conference. Reichental, president and CEO of 3D Systems (NYSE:DDD), a global leader in content-to-print solutions, described a world of hybrid manufacturing where 3D printing is integrated into traditional manufacturing; a world where complexity that is otherwise unachievable, is free and provides opportunities to do things that have not yet been imagined. While this incited excitement in the room, it was no great shock to the hundreds of designers, developers, innovators and 3D printing enthusiasts that came from around the world to attend the first ever 3D printing conference. Among the crowd, the bigger question was how to make the technology more consumer friendly. The companies in attendance were tackling this from a variety of angles, from software and hardware to design and execution. Some of these included, 3D Nation, which focuses on providing customers design assistance; Sculpteo, which offers customers the opportunity to transform 3D files into 3D objects; and Mcor, whose printers use paper as its material at a fraction of the cost. These innovations and products are a step towards the “accessibility and democratization of 3D printing,” that Reichental spoke of in his keynote address. In addition to the solutions the many attending companies are offering, the price point of printers at the exhibit hall, ranging from $400-$100,000+, speak to accessibility as well. This can also be seen by the 3D printed creations on display, which included belts, shoes and purses from 3D Systems, bracelets from Makerbot, and rings and home design from Sculpteo. “The future is here – we just don’t know it yet,” said Brian Evans, of Metropolitan State University of Denver, during his presentation on desktop printing. We at Printing Dress have never believed this to be more true. The push towards perfect footwear has been riding the 3D printing wave the past few months. We saw this with Nike’s football cleat and New Balances’s running shoe. Today, PSFK reported on the customizable, personalizable shoe by designer Pavla Podsednikova. While writing her thesis, Podsednikova realized that the technology to scan, digitize and create fully custom footwear was out there and waiting to be taken advantage of. 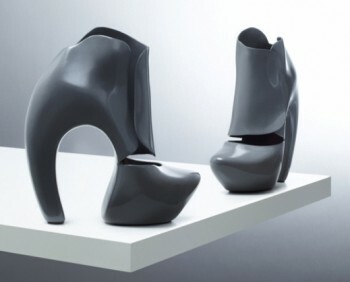 Podsednikova used 3D printing, ABS Vacuum Shaping and Carbon Fiber Lamination in the creation of her shoes. Podsednikova’s various concepts can be seen here. Where’s all the 3D fashion news this week? We’re getting used to our Dita von Teeses in additive dresses, and couture gowns down the runways of Paris. Fingers crossed for more exciting fashtech news in the next 7 days. Coming up this week: a recap on our visit to Lucky FABB in LA, and our favorite 3D find of the week. We also have something printing at Dreambox in Berkeley, and are anxiously awaiting our 3Doodler to arrive! Our thoughts and prayers are with Boston tonight. An exhibition at the London College of Fashion‘s Fashion Space Gallery from next week shows designers exploring digital print in fashion and the potential of 3D printing as a tool for design. A MakerBot Replicator 2 3D printer will be running in the gallery throughout the exhibition, printing objects which will then be put on display. Designers exhibiting objects include Naim Josef, Souzan Youssouf, Ron Arad and Daniel Widrig. The show’s curated by Leanne Wierzba and Gemma Williams. We love this 3D Printed Brass Bracelet by MCODE Jewellry. Perfect on its own or layered with other pieces, it’s a great example of fashion + tech. $255 USD. 1) Introduce yourself! What’s your name, where are you from, and what do you do? I’m Yvonne van Zummeren, I live in The Netherlands and I design artistic jewelry from a 3D printer. I’m also an Art Historian and I take my inspiration for the jewelry from works of art. With my designs, I try to tell both the story of 3D printing and the original story from the artist. 2) When did you first learn about 3D printing? At a graduation party at the end of 2010, a friend of mine told me about 3D printing. I had no clue what he was talking about, I just thought he had too many drinks and let his imagination run wild… But months following that I kept hearing about 3D printing and Dutch Fashion Designer Iris van Herpen became my example. I thought what she did was amazing, but not available for “regular people”. I decided to make my designs more accessible. 3) What was the first thing you ever printed? October 2011 I started to really make it happen. There’s a University of Technology in the city where I live, so I thought that would be a good place to start my quest for more 3D printing knowledge. A nice professor gave me an introduction into this amazing world and he also talked about Shapeways. The first thing I ever printed was a napkin ring from a Shapeways easy creation app. I was very excited, and immediately started sketching my own bracelets! 4) What impact do you envision 3D printing to have on the fashion industry and when? Personally, I divide 3D printing into two categories: hobby 3D printing and professional 3D printing. Both have different styles, materials and printers. For the professional 3D printing category I envision the future of fashion (including jewelry) to be a more customized to the body of those wearing the fashion. It will have a perfect fit! I also think you’ll see a lot of new fashion/jewelry designers like me, who want to show what’s possible with 3D printing and how it’s not just all technology, but that it can be very fashionable as well! For the hobby 3D printing category, in maybe 10 years from now, you’ll print your own clutch and earrings a couple of minutes before your party taxi arrives, which will match the dress you bought that afternoon. 5) Do you see 3D printing as a threat to current designer? If not, why? If so, what should be done? Yes, I can imagine why “professional” fashion and jewelry designers think 3D printing is a threat. I mean, look at me: I don’t have a goldsmith or industrial design education and I’m still a successful jewelry designer. I can imagine that frustrates some designers who did have the education to become “professional” designers. But it’s not only about designing; it’s also about storytelling and being able to market your designs very well. 6) What’s your favorite thing you’ve ever seen 3D printed? That would be the “Escher for Real”-project. It’s amazing to see that the drawings of M.C. Escher are coming to life. The files are also made available to download, so you can print Escher’s work yourself! 7) What material would you love to be able to work with in 3D printers? I can’t wait for the leather from Modern Meadow to be printed! Until that moment I’d like to experiment with as many materials as possible at Dyvsign. Right now the collection consists of the printed materials nylonpolyamide (very flexible, very easy to wear!) and bronze, but soon there will be others. 8) Do you own a 3D printer? If so, what model? What design software do you use? How did you learn how to use it? No, I don’t own a 3D printer. These professional 3D printers are way too expensive and I work with many different materials. I use several 3D printing services to print my designs. My 3D-drawer uses Solidworks to turn my concepts and sketches into design files. 9) What resources would you recommend for someone wanting to do what you do? What should they study? First of all: find a niche. Something that distinguishes you from other designers. That’s the most important thing! Second: just start! At this moment there’s much more information to be easily found online. Two and half years ago it was much more difficult to find even a little bit of information about 3D printing. But right now there are so many websites, fab labs and 3D printing fairs to be found! Third: if you’re like me and you’re good at thinking in concepts, ideas and sketching on paper but not good at the computer drawing part, find yourself a 3D drawer on the online 3D printing communities or in your own neighborhood. But find someone that understands you, with whom you “click”. “Do you think fashion design will go totally 3D?